The unique properties of minerals have long made them invaluable materials for technological innovation – especially in healthcare applications. For instance, minerals like copper and silver are essential to the manufacturing of CAT scan devices, while batteries made from lithium power lifesaving devices like pacemakers and defibrillators. 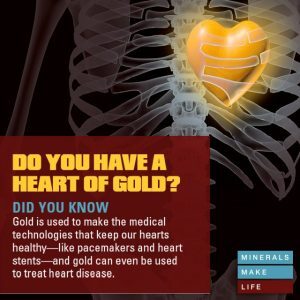 Now, new research shows that minerals are being used in exciting medical treatments and technologies that hold promise for a healthier future. In April, researchers at the University of Queensland announced the development of a new blood test that uses gold nano particles to track cancer cells in melanoma patients. The test helps doctors determine treatment effectiveness and predict patient outcomes. In another study, scientists discovered that graphene can be used to improve testing of heart medications. How? Graphene conducts electricity generated by heart muscles in a way glass and plastic substances cannot. Someday, researchers predict, graphene could lead to the development of the next generation of pacemakers. These are just the two latest examples of how minerals and metals enable new life-saving and life-sustaining medical techniques. While this cutting-edge innovation is driving change, our nation’s minerals mining policy continues to fall behind. It now takes an average of seven to 10 years to get a mine permit in the U.S. By contrast, countries with similarly stringent environmental standards, like Australia and Canada, complete the permitting process in an average of two to three years. Independent studies show that domestic mining projects can lose more than half of their value due to the protracted delays in our mine permitting process that can last up to a decade. Decreased investment in U.S. mining compounded by a growing demand for certain mineral resources has serious implications for our nation’s ability to compete globally. Everywhere you look, mining is fueling, furthering and modeling innovation. Let’s make sure we can continue to drive progress forward. To increase access to important minerals necessary for innovation, call on your legislator to take action now.